Over our 2,000 year history, many images have been used to describe the Church. You've heard the Church likened to a boat - Peter's barque, with Christ at the helm. Very often, the Church is referred to as the bride of Christ. 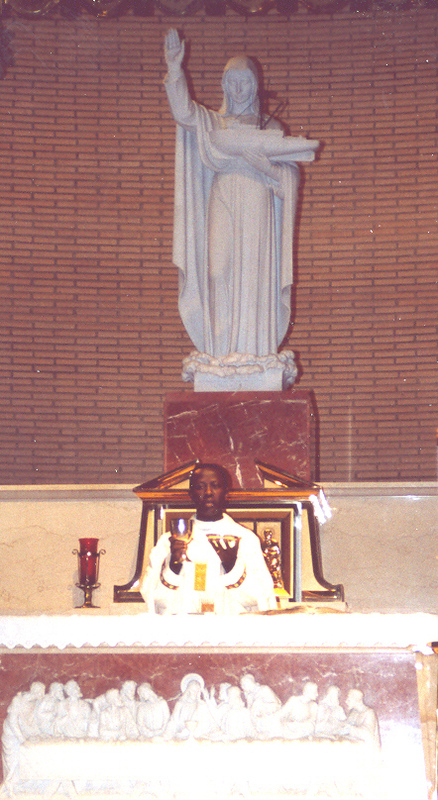 John Paul II likes to use the image of "mother" when describing the Church. There are others. A more contemporary image that is used is that of the Church as gas station - a spiritual gas station or a filling station for grace. In the spiritual gas station analogy, our spiritual car is our soul and we often run out of gas, which is grace. We have to get over to church to get a refill and a tune-up at times, like customers who come to a service station so as to keep the spiritual car of the soul running and humming like a well-oiled machine. Catholics who take good care of their spiritual cars come to Mass for a refill every Sunday or even more, such as our daily Mass goers. They also come for a tune-up, called Confession, every month or so, or more often, if they drive in tough spiritual conditions. I think we all agree that the image has a certain appeal in its simplicity and to the extent that the analogy contains truth. Yet, there's a fatal flaw. That's because the image of the gas station is markedly different from the image of the Church that we read about in our second reading. In our second reading, St. Paul uses a much more vivid, accurate and powerful image when describing the Church. He uses the image of the Church as a body - the mystical body of Christ. It's fair to say that St. Paul could not have used the image of the gas station. After all, they didn't exist at the time. Yet, St. Paul certainly did know what customers were and he could have used a similar example from the commercial world of his day, if a commercial image would be appropriate. So, the fact that St. Paul chose to use the image of the body and not something else should tell us something very important about the Church and our place in it - something quite essential that the image of the gas station lacks. When we come to church, we ought not to come here as customers or consumers - we come here as members. We don't come to have a service performed for us by the priest, as if it were a show. Rather, we come to church to perform service for God and for one another. That's what liturgy means - service, but the service means that we come to provide service for God, not just to get something out of coming to Mass. How often do you hear individuals say, "I don't come to Mass anymore because I don't get anything out of it!?" That's the attitude of a customer, a customer not satisfied with the product - a customer expecting to get something - whether it be inspiration, instruction or grace. Of course, receiving such things are not problematic, but we shouldn't be coming to Mass for what we can get - we ought to come to Mass to give glory and praise and worship to God because He deserves it and because we love Him. We should come to Mass to offer ourselves to God and to each other through the sacrifice offered by the priest at the altar. When individuals say that they get nothing out of Mass, it usually means that they've put very little into it. Their attitude is consumeristic, as if they were at a movie or a concert. If they enjoy themselves, fine. If they don't, they're dissatisfied. When we truly give of ourselves at Mass, when we let the prayers enter our hearts and capture our imagination and our desires, then the Mass will have infinite and inexhaustible meaning for us. When individuals say that they get nothing out of Mass, I always ask them, "Did you receive Holy Communion?" When they reply that they did, then I almost always ask them, "Is not receiving the body, blood, soul and divinity of Christ not good enough or do you not believe in the Eucharist?" That's not an excuse for priests giving bad homilies or being unprepared or for bad liturgical music or for sloppiness in the sanctuary, but at the end of the hour, no matter how everything else went in the Mass, communicants get more than they could ever give at Mass. That's part of the paradox - as much as some think they don't get out of Mass, they get more out of being here merely by being present at the miracle of the consecration than they could ever give back to God. Yes, the Word of God as proclaimed in the first half of the Mass is very important and an essential component of our worship. It's God speaking to us through revelation. The readings and the Gospel can have a powerful effect upon the hearts and minds of those present who are eager to hear and devour the Word. In the Gospel, when our Lord reads from the prophet Isaiah, St. Luke writes that "the eyes of all in the synagogue looked intently at Him." In our first reading, we learn that upon hearing Ezra read the scroll, the people "bowed down and prostrated themselves before the Lord . . . weeping as they heard the words of the law." What an impact the Word had on them because they were willing to allow the Word to touch their hearts! So, we should ask ourselves just how eager and receptive we are to hearing God's word at Mass. Do we make every effort to really listen attentively to each reading? Do we arrive early enough to look over the readings before Mass so as to prepare our hearts to hear them proclaimed? Or, do we let our mind wander and let the words flow right past us like background noise or elevator music? If we give ourselves more devotedly to the Word of God, to the prayers, to hymns at Mass, if we try to participate with reverence and devotion, then we will be worshipping God as living members of the body. If we chose to sit back and be entertained, we act like customers, not members of the body. The other major flaw with the gas station image is that at the gas station, the individual customers don't really need each other. They come and go as individuals to have their needs met. By contrast, the image of the body implies that we are connected, that we have a relationship with each other and thus are responsible for one another. We ought not come to church as isolated customers but as members joined to the same body. This is part of what characterizes a body - mutual interdependence, not independence. St. Paul states, "If one part suffers, all parts suffer with it; if one part is honored, all the parts share its joy." Language like this doesn't sound like customers at a a gas station. However, it does should like the Church of the Lord Jesus. In this body, every part is important and has a role to play and has gifts to contribute. This is also why every human life counts, because each life is an absolutely unique gift from God and its why thousands marched in Washington this past Thursday - to witness to the infinite value of every human life - because the Lord Jesus had made us part of His body and "if one part suffers, all the parts suffer with it." Perhaps it was St. Teresa of Avila who summed it best when she wrote, "Christ has no body now on earth but yours, no hands but yours; no feet but yours. Yours are the eyes through which Christ's compassion is to look out to the world and yours are the feet with which He is to go about doing good; yours are the hands with which He is now to bless." The Scriptures today ask us to consider how we see ourselves in relationship to the Church. Am I only a customer, expecting satisfactory service OR am I a truly living and vital member of the mystical Body of Christ. May each of us come to the altar of God with humble hearts, full of gratitude and ready and willing to listen to God's word and live it daily in faith. May we approach our time in church with a disposition that wants to give glory to God and not merely get what we can obtain here so as to better imitate the Lord who GIVES us His Body and Blood in Holy Communion.